HugABull Rescue Society Fosters Over 20 rescued pit bulls! There are a lot more doggie hugs to be had within the HugABull Advocacy and Rescue Society this week after the organization was contacted by the Surrrey SPCA shelter and asked to take in 23 pit bulls. The dogs were found during a police inspection of a home in Surrey last week, and the neglected pit bulls were taken into custody. Luckily, HugABull, a local Vancouver organization that helps to care for and adopt out homeless pit bulls and other bully dog breeds, took on the daunting task of fostering these precious dogs most of which were covered in wounds and suffering from a variety of diseases. Of the 26 dogs found in the home, 19 were puppies, ranging in age from six weeks to six months, and all were suffering from a combination of severe mange, respiratory infections, kennel cough or open wounds. These are all treatable conditions, but the owners did nothing to care for their animals. This is evidence that the dog owners were basically running a backyard puppy mill. The blue colored pit bulls are a popular breed these days, and it appears that the owners were breeding litter after litter just to sell the puppies. Any shelter taking on this many dogs at once has to ask for help, and the Surrey SPCA did the right thing when they called HugABull. Shelagh Begg, director for the HugABull Society, said that, of course, they had to help out. Pit bulls are a special breed of dog, and HugABull, along with help from Bully Buddies (another rescue group), has lots of experience evaluating the temperament of this breed, helping them to recover from abusive situations and integrating them into the community. But, first and formost, these 23 dogs need a whole lot of love and special veterinary care. All the while, the HugABull volunteers are getting to know their new doggie friends. 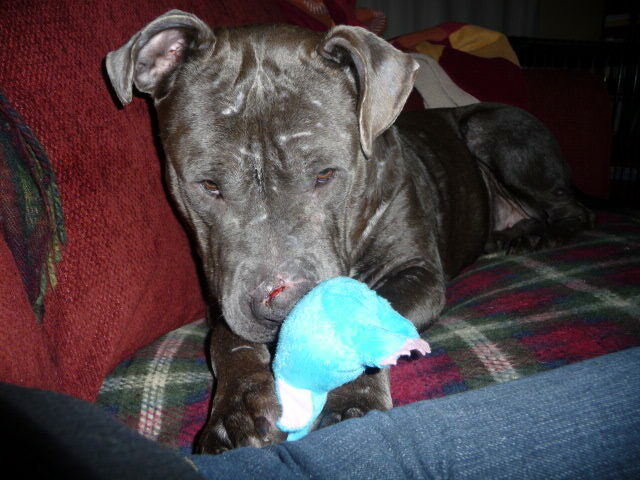 Begg, herself, has become a foster parent to a dear two-year-old pitty named Tandy. She appeared to have been one of the most neglected the bunch, and Tandy had open bite wounds and bite scares from head to toe. Yet as I interviewed Begg over the phone about her new housemate, Tandy sleeping snores could be heard through the receiver! It sounded like Tandy is settling in, and this is perhaps the first time in her life she felt safe enough to relax, sleep and snore. Several of the dogs are still receiving medical care at Cambie Animal Hospital in Vancouver. One beautiful red-colored pit bull was found to have an old bite injury to her front leg that became infected right down to the bone. She is now named Scarlet for her beautiful color, and is responding well to antibiotics according to Begg. As soon as Scarlet is released from the hospital, a foster home will be waiting for her. Begg said that her organization was able to find 23 foster homes in 24 hours thanks to Twitter and Facebook announcements. The HugABull volunteers sure rallied for this rescue, but now what? Now is the hard part. New foster parents will take care of the adult pit bulls for 30 days to de-stress the dogs and help them learn to live indoors. The puppies will require a considerable veterinary care and mange treatments, so it may be up to three months before they are up for adoption. But most of all, the stress and violence that these poor animals have been through will require a 10-fold amount of kindness and love to help them recover from the emotional consequences of living in a puppy mill. I am particularly grateful to organizations like HugABull and Bully Buddies because pit bulls and other bully breeds occupy a strange place in our society. On one hand ownership of such breeds to extraordinarily restricted in Delta and Richmond where such dogs must be muzzled and live in heavily confined areas. Yet simultaneously, this same breed is popular amongst back-yard breeder because the public will buy the puppies for hundreds of dollars. Currently the fad of owning these blue-colored pit bulls appears to have lead to this particular case of backyard breeding. Yet, currently, our laws only work to restrict the innocent lives of these animals, and not the people who cause them to be born and raised in cruel conditions. As a community, I hope we can act to change this. If you would like to help HugABull to heal and care for these precious dogs, donations can be made through the HugABull website (hugabull.com) or you can donate directly to Cambie Animal Hospital ((604) 321-6600) to help with HugABull’s veterinary costs. HugABull is also in need of high-quality puppy food for the 19 puppies in their care. If you have a donation of puppy food, please contact the Society at info@hugabull.com. Christie Lagally is freelance pet writer who lives in Richmond.